Three investigators have reported that tidal volume (VT) in children is inaccurate when measured at the ventilator, even when effective VT is used [1–3]. Cannon and colleagues  studied 98 infants and children and found a significant discrepancy between expiratory VT measured at the ventilator and that measured with a pneumotachometer. Calculation of the effective VT did not alter this discrepancy. Castle and colleagues  studied 56 intubated children and found that exhaled VT displayed by the Servo 300 significantly overestimated VT measured at the airway by between 2% and 91%. After correcting for gas compression, effective VT overestimated true VT by as much as 29% in older children but underestimated the true VT by up to 64% in the smallest infants. Neve and colleagues  studied 27 infants and found that VT was overestimated by the ventilator in comparison with VT measured at the Y piece. None of these investigators controlled for endotracheal tube (ETT) leakage, which is more of a problem in children than in adults because of the use of uncuffed ETTs. Accurate measurement of VT is increasingly important because the Acute Respiratory Distress Syndrome (ARDS) Network investigators have shown that the use of a low effective VT leads to decreased mortality in their patient population . The effective VT goal in their ventilator protocol was 6 ml/kg but could be reduced to as low as 4 ml/kg if the plateau pressure was above 30 cmH2O. At such low VT values, accurate measurement is imperative to prevent atelectasis and subsequent ineffective minute ventilation. Clinically, there are three methods to estimate delivered VT: first, direct measurement at the expiratory limb of the ventilator; second, direct measurement at the ETT with a pneumotachometer; and third, indirect calculation of effective VT by using set VT minus calculated compressible volume lost in the ventilator circuit . The principle of Boyle's law (the volume of gas decreases as the absolute pressure exerted by the gas increases, and vice versa) is used to calculate the compressible volume in ventilator circuits. How effective VT compares with VT measured at the airway has not been rigorously tested. Using VT measured at the ETT as the gold standard, we used three test lung models in a controlled laboratory setting to evaluate the accuracy of ventilator measured VT and effective VT under conditions of poor lung compliance, with and without ETT leakage, across a range of simulated patient sizes. We proposed that the discrepancy between effective VT and VT measured at the ETT in children was due mainly to ETT leakage around uncuffed ETTs, and that in situations with minimal ETT leakage there would be minimal difference between the effective VT and VT measured at the airway. A Servo 300 ventilator (Siemens-Elema, Solna, Sweden) in the SIMV volume control mode was used. A pressure differential pneumotachometer (CO2SMO Plus; Novametrix Medical Systems, Wallingford, CT) was used between the ventilator and ETT connection. The temperature of the humidifier was set at 37°C. A heated disposable respiratory circuit (Allegiance Healthcare Corporation, McGaw Park, IL) was used. We tested the compliance of the circuit to ensure that it was stable across a range of conditions. To do this, we first set the ventilator on the following: inspiratory time of 1.3 s, positive end-expiratory pressure (PEEP) of 0, respiratory set frequency of 6 breaths per minute, and a pause time of 15%. VT was increased by increments of 50 ml and the plateau pressure was recorded from the ventilator with the patient outlet occluded. No component other than the humidifier was added to the circuit . A linear relationship was found, with no change of the circuit compliance at high airway pressure. In the pediatric and infant models, a valve distal to the ETT was used to adjust volume leaks of 0%, 10%, 20%, and 30%. A shown in Fig. 1, a separate pneumotachometer (NVM-1; Thermo Respiratory Group, Palm Springs, CA) was used for independent measurement of the percentage of ETT leakage. The Servo 300 was used for all test conditions. To control for differences between the ventilators, we tested each set of experimental conditions on three different ventilators. 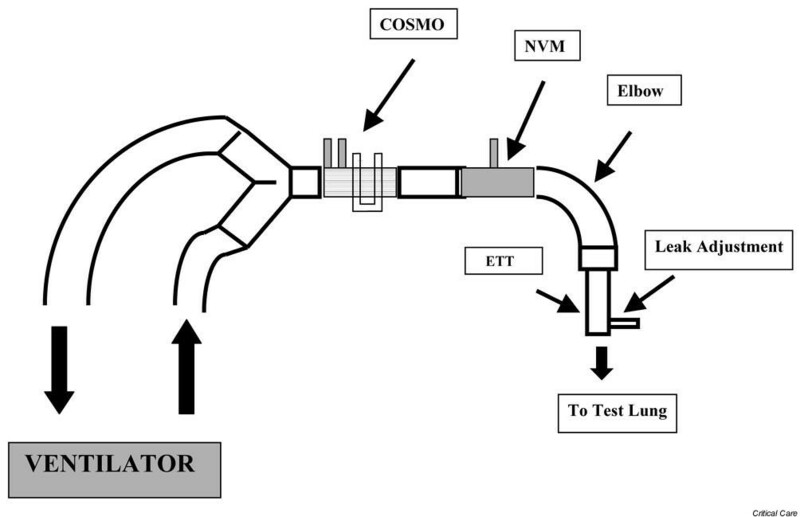 The CO2SMO Plus respiratory mechanics monitor was used to measure the VT at the ETT. This monitor measures flow with a fixed-orifice differential pressure pneumotachometer located at the ETT. Respired gas flowing through the flow sensor produces a small pressure decrease across the two tubes connected to the sensor. This pressure decrease is transmitted through the tubing sensor to a differential pressure transducer inside the monitor and is correlated with flow according to a factory-stored calibration. The pressure transducer is automatically 'zeroed' to correct for changes in ambient temperature. Data are filtered and sampled at 100 Hz. The monitor continuously displays a range of ventilatory variables, including both VT and airway pressures. Three CO2SMO Plus sensors are available: neonatal, pediatric, and adult. The manufacturer recommends that the choice of sensor be based on various criteria: first, the diameter of the tracheal tube; second, the patient's age; third, the expected flow/volume range; and fourth, the acceptable levels of dead space and resistance. Table 1 lists the experimental conditions for all lung models. Before data collection, all ventilators, respiratory mechanics monitors, and tachometers used in this study were calibrated in accordance with the manufacturer's recommendation. ETT, endotracheal tube; FiO2, fraction of inspired oxygen; PEEP, positive end-expiratory pressure. To ensure that different ventilators and monitors did not influence the results, all data were repeated three times, each time with a different Servo 300 ventilator and a different CO2SMO Plus monitor. A TTL™ adult test lung (Vent Aid; Michigan Instruments Inc., Grand Rapids, MI) was used. This device has two separate lungs, each with a functional residual capacity (FRC) of 900 ml. The lung compliance can be adjusted by moving a spring up and down with a compliance ranging from 10 to 150 ml/cmH2O per lung. Each lung is tested before use to assess for leakage. Lung–thorax compliance levels were set at 10, 20, 40, 60, 100, and 150 ml/cmH2O. A TTL™ adult test single lung was used with the FRC adjusted to give 30 ml/kg by displacing the extra volume with water-filled bags. Lung–thorax compliance levels were set at 5, 10, 20, 40 and 60, ml/cmH2O. An infant lung simulator (D.B&M products, Redlands, CA) was used. The model has three different preset compliances of 1, 3, and 10 ml/cmH2O. Data were recorded from both the ventilator light-emitting diode display and the CO2SMO Plus monitor display by a single observer. Variables recorded were inspired VT, expired VT, peak inspiratory pressure (PIP), PEEP, and plateau pressure. Effective VT was calculated from the following equation : set inspired VT - [circuit compliance × (PIP - PEEP)]. 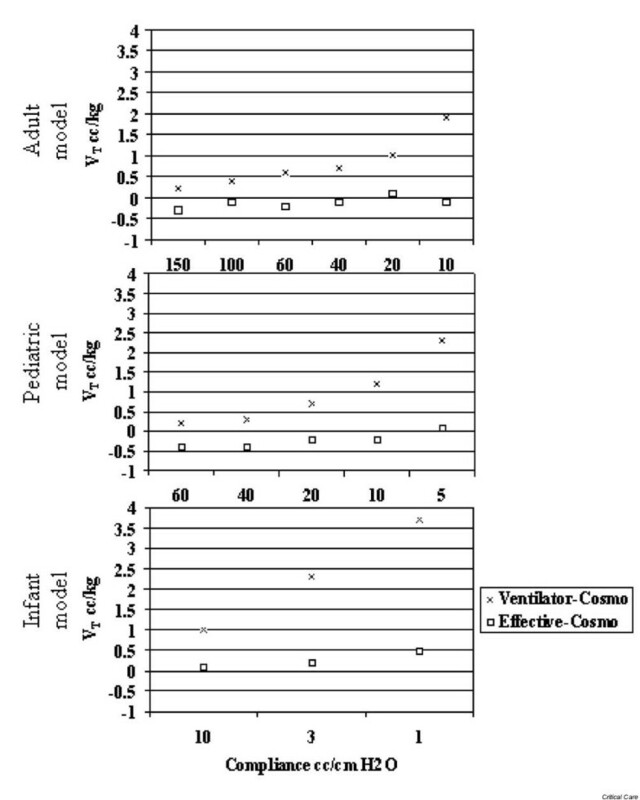 The major outcome variable was the calculated difference between the effective VT and the exhaled VT measured either at the ventilator or at the ETT in each experiment. For each set of test conditions (Table 1) we used the mean of the three replicate measurements and also give the highest and lowest values. VT was adjusted for the simulated weights and expressed as ml/kg. We determined a priori that the difference between the VT values would be considered excessive if it exceeded 10% of the 6 ml/kg goal (0.6 ml/kg). As shown in Fig. 2, for the adult, pediatric, and infant models with no ETT leak, the difference between VT measured at the ETT and at the ventilator increased with decreasing lung compliance. VT measured at the ventilator was always higher than that measured at the ETT. The ventilator measurement overestimated VT by more than 10% (0.6 ml/kg) as lung compliance dropped to moderately low values and the difference exceeded 20% (1.8 ml/kg) at the lowest lung compliances in each model. The standard deviation of the difference was 0–0.2 ml/kg for all sets of measurements. In all models, in the absence of ETT leakage the difference between effective VT and VT measured at the ETT was less than 10% across the range of lung compliances with a standard deviation of 0–0.2 ml/kg for all sets of measurements. As shown in Fig. 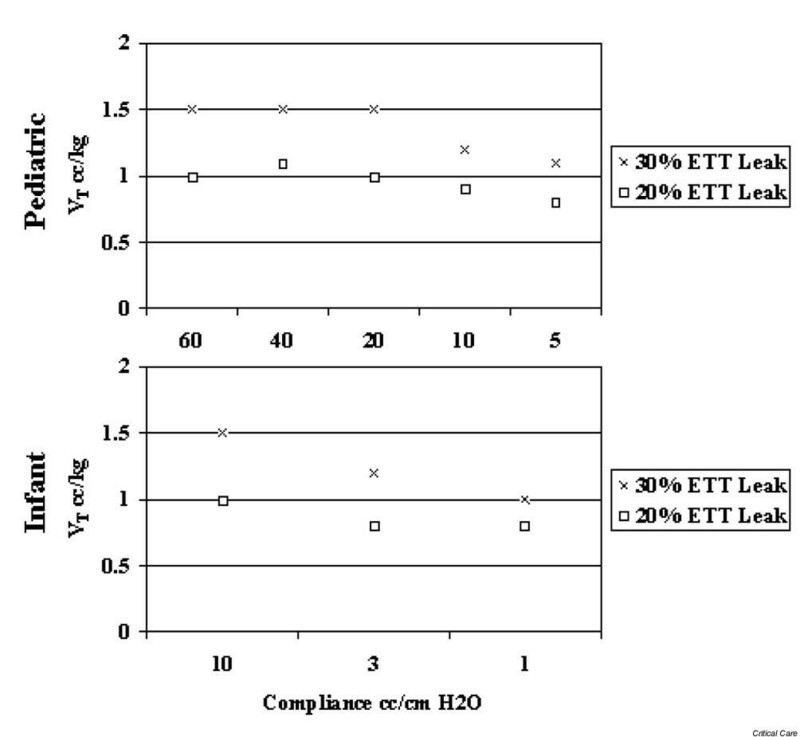 3, however, the agreement between effective VT and VT measured at the ETT was poor when a 20% and 30% simulated ETT leak was added in the infant and pediatric test lung models. Under these conditions, the effective VT was at least 10% higher than that measured at the ETT for all simulated conditions, and the standard deviation was 0.1–0.4 ml/kg for all sets of measurements. 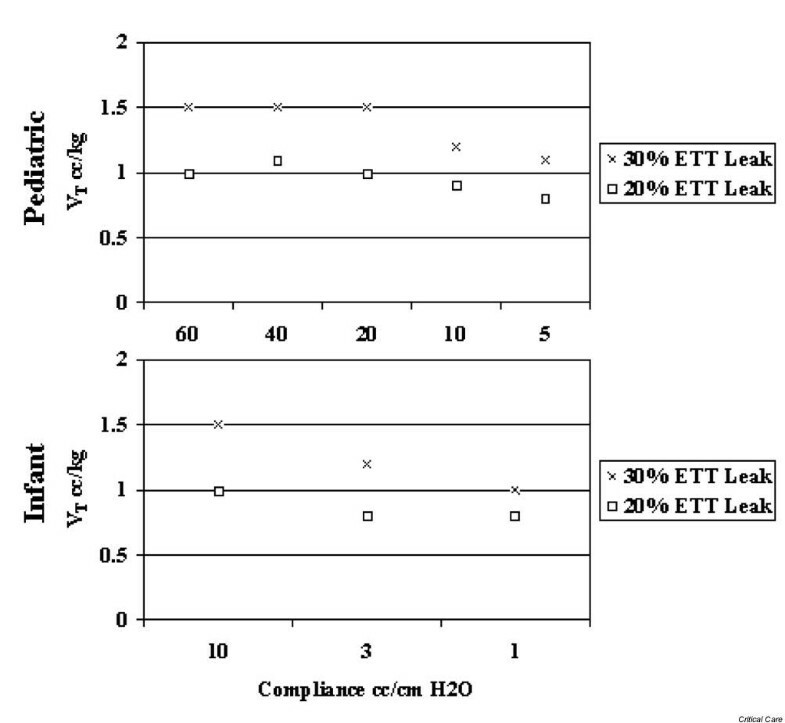 Using well-controlled experimental conditions, we showed that in the absence of ETT leakage, effective VT approximated the VT measured at the ETT in the test lung even when lung compliance was poor. As expected, exhaled VT measured at the ventilator became increasingly inaccurate with poor lung compliance. In the presence of ETT leakage, effective VT overestimated the VT measured at the ETT by at least 0.6 ml/kg. It is clear that in the presence of ETT leakage, effective VT is inaccurate and VT is most accurately estimated at the airway. We used an in vitro model to manipulate experimental conditions while controlling for all other variables. Accurate measurement of VT is essential when a low-VT strategy is used to protect injured lungs as is recommended by the recent ARDS Network study . In the adult lung model, we manipulated the compliance to simulate the lung compliance quartiles reported in the ARDSNet study . Our findings have clinical implications. In agreement with other investigators [1–3], we found that unadjusted VT measured at the ventilator is highly inaccurate. We found this inaccuracy to increase markedly when lung compliance was abnormal. This means that dual-control automated ventilator modes (for example volume support or pressure-regulated volume control) that make adjustments based on VT measured at the ventilator might ineffectively ventilate patients with poor lung compliance. Automated ventilator modes should be used with care in critically ill children. We support the current recommendations of previous investigators [1–3] that VT should be measured at the ETT in critically ill children receiving mechanical ventilator support. These investigators emphasized the need to measure VT at the ETT for all children; they did not control for the presence of uncuffed ETTs in their studies or evaluate the effect of leakage. Significant loss of VT occurs when both ETT leakage and poor lung compliance are present. Although the VT measured at the ETT may underestimate the actual VT being delivered in this situation, it is still the best estimation of the tidal volume delivered to the lung. Use of cuffed ETTs to minimize ETT leakage may lead to more accurate measurement of VT when lung compliance is poor . When ETT leakage is 20% or greater, Main and colleagues  reported inconsistent tidal volume delivery and gross overestimation of respiratory compliance and resistance in children. When ETT leakage is minimal, it seems from our simulated lung models that calculation of effective VT would give similar readings to VT measured at the airway, even in small patients. This could potentially negate the need for the addition of sensors at the airway and their associated increase in airway resistance for small ETTs . Unfortunately, ETT leakage is dynamic and dependent on head position. Unless a simple, accurate and continuous means of measuring ETT leakage is available, it is safest to measure VT at the airway in all mechanically ventilated children. Future studies of VT measurement accuracy in mechanically ventilated children should control for the degree of ETT leakage. Previous investigators have emphasized the need to measure tidal volume at the endotracheal tube for all mechanically ventilated children. When endotracheal leakage is minimal, it would appear from this study using simulated lung models that calculation of effective tidal volume would give similar readings to tidal volume measured at the airway, even in small patients. Future studies of tidal volume measurement accuracy in mechanically ventilated children should control for the degree of endotracheal tube leakage. This study was funded by Novametrix Medical Systems and ARAMCO.